Any sailboat needs a vertical appendage on the lower part of its hull to avoid being blown sideways whenever the wind comes from the side. Except when the boat is sailing directly downwind, the wind always hits one side of the boat or the other and would keep the boat from sailing as nearly straight forward as possible. Most larger sailboats have a fixed keel as a vertical appendage, which typically also is weighted to prevent the boat from heeling excessively or capsizing due to the wind in the sails (in essence, being blown over). Small sailboats, in contrast, usually have a centerboard (or daggerboard—described later) that can be lowered as a vertical appendage to prevent side-slipping. Raising the centerboard allows the boat to be put on a low trailer, carried car-top, or launched from a beach. Most centerboards rotate up and down on a pivot pin at the top. Typically they swing up into a centerboard trunk (as in the photo) that prevents water from entering the hull. A control line is used to raise the centerboard partly or fully. A weighted sailboat also provides ballast, like a fixed keel. A weighted board usually requires a small winch to crank up the weight. In its lowered position, the centerboard usually extends straight down into the water below the boat. In this photo, you can see some of the board in the water beneath the water. Again, the primary function of the centerboard is to prevent the boat from being blown sideways by the wind from either side. The trimmed sails and rudder direct the boat to move in the direction the bow points, which it would still do even without the centerboard, but with the ​board up, a second component of motion would be in the direction the wind is blowing. These two components would add up to a crabbing movement off to the side of the intended forward direction. A beginner can put the centerboard fully down (as soon as in water deep enough) and simply leave it down for the whole sailing session while focusing on other aspects of sailing. Some small sailboats, like the Sunfish and the Laser, have a daggerboard rather than a centerboard. A daggerboard is a long, straight board that is inserted by hand into a slot and down through the hull into the water. It functions in the same way as a centerboard. 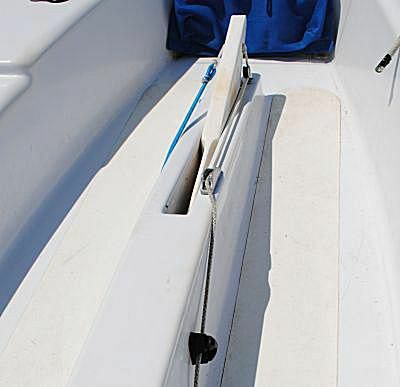 The centerboard or daggerboard increases the drag (friction) on the hull, however, and slows the boat unnecessarily when sailing downwind—so experienced sailors generally raise the centerboard when it is not needed. "Points of sail" refers to the direction in which the boat is sailing in relation to the wind. Close-hauled is sailing as close to the wind as possible, a beam reach with the wind straight from the side, a run dead downwind, etc. When learning to position the board most effectively, beginners can mark the control line (or top of centerboard trunk if the board's top edge is visible) with a Sharpie or pieces of tape to indicate the different board heights—in order to quickly position the board at different points of sail. Solo sailors generally lower the board completely before heading up toward the wind, to concentrate on steering and managing the sails. When turning off the wind, leave the board down until the new course is reached and the sails trimmed, and then position the board appropriately. When sailing as a twosome, the crew not at the helm handles the centerboard and sails and can fluidly raise and lower the centerboard in gradual steps through a turn. A final use of the centerboard is to help right a small sailboat following a capsize. The sailor stands on the centerboard while holding the boat's rail and leaning back, and thereby levers the boat back upright.